Please select the day(s) you would like to participate. Themes are not all confirmed and are subject to change. Below are the only days still available. This is an application only. It is not a guarantee of vendor space. If we accept your application, you will be sent a contract via snail mail. Payment for the booth will be due on the date as stated by the contract. The vendor spaces are under the eaves of the Farm Building. You would be outside, but covered. The spaces are on concrete or firm dirt. They are level 10' by 10' spaces, some have a little additional space behind them. Electricity is available if you need it and we provide one 8' rectangular table and 2 chairs. 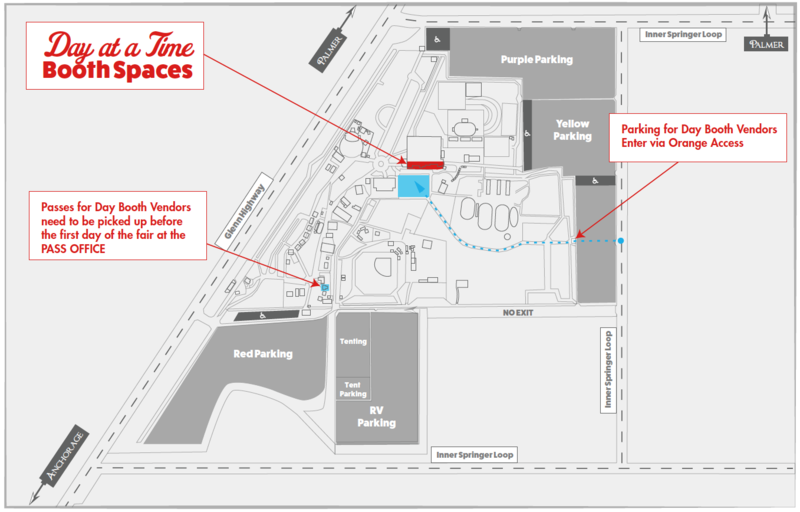 You also receive 2 admittance passes and 1 parking pass per day. If you have questions call 907.746.7173 or e-mail: sheri@alaskastatefair.org between 8:00 am and 4:00 pm, Monday through Friday.